Hungarian botanist; born April 25, 1843, at Lugos; died July 12, 1896, at Klausenburg. While a student at the University of Vienna he wrote "Geschichte der Botanik in Ungarn" (Hanover and Budapest, 1863), and soon after, "Versuch einer Geschichte der Ungarischen Botanik" (Halle, 1865). In 1866 he published a work on the flora of Slavonia; in 1877 one on that of Montenegro, Bosnia, and Servia; and in 1879 one on that of Rumania. For the last-named work he was elected (1880) a member of the Academy of Sciences of Budapest, and was made Knight of the Order of the Crown of Rumania. He embraced Christianity. 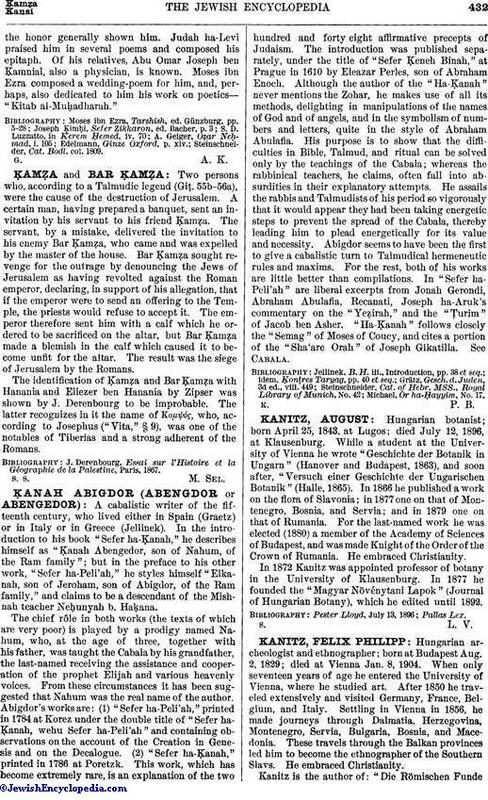 In 1872 Kanitz was appointed professor of botany in the University of Klausenburg. In 1877 he founded the "Magyar Növénytani Lapok" (Journal of Hungarian Botany), which he edited until 1892.